This page displays garage door opener remotes, M3-2312 garage door opener 2-button mini control transmitter, M3-3313 garage door opener 3-button micro keychain remote control, M3-2314 4-button mini remote control transmitter, M3-2432 2-button mini remote control, ML-1391 1-button remote control, ML-1392 2-button remote control, 8030425 4-button mini remote control transmitter, 73870 universal radio kit 315MHz, 64847 1-button mini keychain remote control, M3-631 wireless keyless entry system, 86222 replacement keyless entry system cover, and 89464 multifunction wall control panels that are for sale, in stock, and ready to ship. 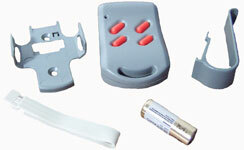 2-button Mini remote control transmitter. Digital 382, 122436. 3-button Micro keychain remote control, NO VISOR CLIP included. keychain ONLY. Use 75424 Universal Radio Kit found below. Garage Door Opener Universal Radio Kit 315MHz. • Compatible with models: M-4500, M-4700, Q-7500, Q-7700, Q-7900, M-Line, Q-Line, ML-543, M3-543NL. Ability to control up to 4 different garage openersthat each work on a differnt code, or to control one dooropener with up to 4 different pins. Replacement cover, SLIDE-UP design, ONLY for model M13-631 keyless entry. Program connector for ML to M3 remotes and keypads. 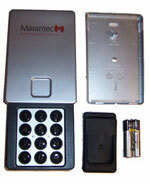 Program connector for M3 remotes and keypads. Program connector for ML remotes and keypads.